Adaptive immunity depends on mature thymocytes leaving the thymus to enter the bloodstream and the trafficking of T cells through lymphoid organs. Both of these require heterotrimeric Gαi protein signaling, whose intensity and duration are controlled by the regulator of G protein signaling (RGS) proteins. In this study, we show that RGS protein/Gαi2 interactions are essential for normal thymocyte egress, T cell trafficking, and homeostasis. Mature thymocytes with a Gαi2 mutation that disables RGS protein binding accumulated in the perivascular channels of thymic corticomedullary venules. Severe reductions in peripheral naive CD4+ T cells and regulatory T cells occurred. 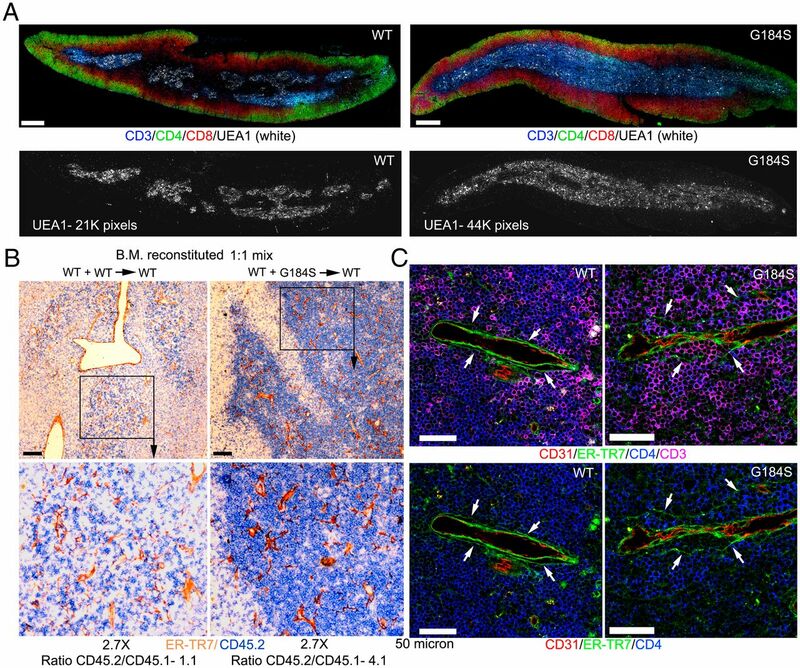 The mutant CD4+ T cells adhered poorly to high endothelial venules and exhibited defects in lymph node entrance and egress. The kinetics of chemokine receptor signaling were disturbed, including chemokine- induced integrin activation. Despite the thymic and lymph node egress defects, sphingosine-1-phosphate signaling was not obviously perturbed. This study reveals how RGS proteins modulate Gαi2 signaling to facilitate thymocyte egress and T cell trafficking. Signaling downstream of chemoattractant receptors regulates the trafficking of thymocyte progenitors from the bone marrow to the thymus, organizes the transitions and positioning of thymocytes within the thymus, and controls the egress of mature thymocytes into the blood (1, 2). Naive, effector, and memory T cells rely on chemoattractant receptor signaling to direct their entrance, egress, and positioning in lymphoid organs and at inflammatory sites (2–4). The major chemoattractant receptors influencing thymocyte and T cell behavior are G protein–coupled receptors (GPCRs), which activate the heterotrimeric G protein Gi (Gαiβγ) to link to downstream effectors. A ligand-bound chemoattractant receptor accelerates Gαi GDP/GTP exchange (5). This shifts the balance toward GTP-Gαi and causes a functional dissociation of the βγ subunits. Although Gαi subunits possess an intrinsic GTPase activity that limits the time for which Gαi remains GTP bound, the rate of hydrolysis is slow. However, GTPase-activating proteins (GAPs) greatly accelerate this intrinsic GTPase activity, thereby limiting downstream effector activation as GDP-Gαi rapidly reassembles with βγ. The major GAPs for Gαi are members of the regulator of G protein signaling (RGS) protein family (6, 7). Surprisingly, RGS proteins also enhance the onset of GPCR-initiated Gαi signaling. How they accomplish this remains unclear, although it depends on their GAP activity (8–10). Manipulating RGS protein expression in T cell lines impacts chemokine responsiveness, and transgenic expression of Rgs16 in murine T cells reduced migration to inflammatory sites (11, 12). The analysis of gene-targeted mice has also supported a functional role for individual RGS proteins in T cell trafficking and function. The loss of Rgs1 selectively enhanced gut T cell chemotaxis and impaired the colitogenic potential (13). T cell activation increases Rgs3 expression, and targeting Rgs3 in mice disturbed T cell migration (14). The loss of Rgs16 enhanced pulmonary inflammation in an infection model by altering chemokine-induced T cell trafficking (15). Despite these results, an overall assessment of the role of RGS proteins in T lymphocytes has remained difficult in part because T cells express multiple RGS family members. Rgs mRNA profiling has revealed a rich and varied expression during T cell development and among T cell subsets (http://www.immgen.org/databrowser/index.html). Mapping the site of interaction of RGS proteins with Gαi proteins has provided a partial solution to this redundancy. A single mutation in Gαi proteins renders them insensitive to all RGS proteins, as it abrogates protein binding (16, 17). This mutation does not affect Gαi binding to receptors, βγ, or effectors, nor does it affect Gαi expression. Mice with a mutation in the Gnai2 locus (Gαi2 G184S) have been made, which we refer to as G184S mice (18). Previous study of these mice has revealed defects in neutrophil and B lymphocyte migration, enhanced platelet aggregation, abnormal cardiac function, and CNS dysfunction (19–22). Because this mutation affects all cell lineages, we have largely studied thymocyte development and peripheral T cells from mice reconstituted with either wild-type (WT) or G184S mice bone marrow, or with a 1:1 mix. The loss of Gαi2/RGS protein interactions led to a somewhat surprising and severe phenotype in the T cell compartment. The implications of our findings are discussed. C57BL/6 and B6.SJL-Ptprca Pepcb/BoyJ (CD45.1) mice were obtained from The Jackson Laboratory. Gαi2 G184S (G184S) mice were provided by Dr. R. Neubig (Michigan State University) and backcrossed >17 times onto C57BL/6 mice. For those experiments that directly compared WT and G184S mice, littermate controls were always used. For bone marrow reconstitution, 27-wk-old CD45.1 mice were irradiated twice with 550 rad for a total of 1100 rad and received bone marrow from C57BL/6 CD45.2 mice (control) or from G184S CD45.2 mice. Mixed chimeric mice were made by reconstituting 20 irradiated CD45.1 mice with a 1:1 mix of bone marrow from C57BL/6 CD45.1 mice (WT) and from G184S CD45.2 mice. The engraftment was monitored by sampling the blood 28 d later. The mice were used 6–8 wk after reconstitution. All mice used in this study were 6–14 wk of age. Mice were housed under specific pathogen-free conditions. All animal experiments and protocols used in the study were approved by the National Institute of Allergy and Infectious Diseases Animal Care and Use Committee at the National Institutes of Health. Thymocytes and splenic CD4+ T cells were isolated by negative depletion using biotinylated Abs to B220, CD8, Gr-1 (Ly-6C and Ly-6G), NK1.1, TCRγδ, Ter119, and CD11c and Dynabeads M-280 streptavidin (Invitrogen). The CD4+ T cell purity was routinely >95%. When needed, CD4+ T cells were cultured in RPMI 1640 containing 10% FCS (Life Technologies), 2 mM l-glutamine, antibiotics (100 IU/ml penicillin and 100 μg/ml streptomycin), 1 mM sodium pyruvate, and 50 μM 2-ME. Cell culture media for S1P chemotaxis were same as above except charcoal-dextran–filtered FCS was used. On occasion, mature thymocytes were isolated from total thymocytes by sorting for cells that expressed CD4, TCRβ, and CD62L, but that lacked CD69, using a FACSAria (BD Biosciences). In some assays CD4 T cells were enriched for naive cells by adding an Ab to CD44 to the negative selection Ab mixture. Additionally, CD4 T cells expressing high levels of CD62L and low levels of CD44, or low levels of CD62L and high levels of CD44, were isolated by cell sorting. The sources of the Abs are listed below. Single cells were resuspended in PBS, 2% FBS, and stained with fluorochrome-conjugated or biotinylated Abs against B220 (RA3-6B2), CD24 (M1/69), CD3 (145-2C11), CD4 (GK1.5 or RM4-5), CD5 (53-7.3), CD8 (53-6.7), CD11c (HL3), CD11b (M1/70), CD184 (CXCR4, 2B11), CXCR3 (CXCR3-173), CCR7 (4B12), CXCR5 (2G8), CD11a (M17/4), CD49d (9C10, MFR4.B), CD54 (3E2), CD62L (MEL-16), NK1.1 (PK136), TCRγδ (GL3), TCRβ (H57-597), Ly6G (1A8), Ly6C (AL-21), CD279 (RMP1-30), CD44 (IM7), CD25 (PC61), CD45RB (16A), Qa2 (695H1-9-9), CD69 (H1.2.F3), CD45.1 (A20), or CD45.2 (104) (all from eBioscience, BioLegend, or BD Pharmingen). Biotin-labeled Abs were visualized with fluorochrome-conjugated streptavidin (eBioscience). A Live/Dead fixable aqua dead cell stain kit (Thermo Fisher) was used in all experiments to exclude dead cells. Data acquisition was done on a FACSCanto II (BD Biosciences) flow cytometer and analyzed with FlowJo software (Tree Star). The cell proliferation studies were performed using CFSE (Thermo Fisher), cell proliferation dye eFluor 450, or cell proliferation dye eFluor 670 (eBioscience) in a standard dye dilution assay. Purified cells were stimulated for 96 h with various combinations of the following reagents: anti-CD3 (2 μg/ml; BD Pharmingen), anti-CD28 (2 μg/ml; BD Pharmingen), and IL-2 (10 ng/ml; R&D Systems). Data acquisition was done on FACSCanto II flow cytometer. The percentages of cells that divided and the proliferation indexes were calculated using FlowJo software. The percentage of cells that divided is the percentage of the cells of the original sample that divided (assuming that no cells died during the culture). The proliferation index is the total number of divisions divided by the number of cells that went into division, again assuming no cell death. Lymph node and spleen CD4+ T cells were intracellularly stained for S1PR1 using the BD Biosciences Cytofix/Cytoperm fixation/permeabilization kit protocol and an Ab (dilution of 1:100) directed against an intracellular S1PR1 epitope. The S1PR1 Ab (H-60; Santa Cruz Biotechnology) and Alexa Fluor 647– or Alexa Fluor 488–conjugated donkey anti-rabbit IgG (Thermo Fisher) were used. For the S1PR1 downregulation, total thymocytes were rested in RPMI 1640/10 mM HEPES for 30 min at 37°C/5% CO2 before stimulation with 100 nM S1P or solvent (DMSO). Cells were fixed in 2% paraformaldehyde for 10 min, washed and stained with CD4–allophycocyanin–eFluor 780, CD8–eFluor 450, CD62L–Alexa Fluor 488, CD24–PerCP–eFluor 710 Abs, and S1PR1-PE, which is directed against an external S1PR1 epitope (R&D Systems). The S1PR1 immunostaining was done as described (23). The levels of phosphorylated signaling molecules were assessed with Abs against phospho-Akt Alexa Fluor 647 (D9E), phospho-Erk (197G) Alexa Fluor 647, and phospho–ezrin (Thr567)/radixin (Thr564)/moesin (Thr558) (pERM), all from Cell Signaling Technology. Isotype control staining was performed using rabbit IgG isotype mAb Alexa Fluor 647 (DA1E; Cell Signaling Technology). pERM was detected with anti-rabbit Alexa Fluor 647 secondary (Thermo Fisher). The intracellular staining was performed as described in the manufacturer’s protocol. Expression of the phosphorylated proteins in mature (Qa2highCD24low) single-positive (SP) thymocytes were determined using a FACSCanto II flow cytometer. Chemotaxis assays were performed using a Transwell chamber (Costar) as previously described (24). The numbers of cells that migrated to the lower well after 2 or 3 h incubation were counted using a MACSQuant flow cytometer (Miltenyi Biotec). The percentage migration was calculated as the numbers of cells of a given subset that migrated into the bottom chamber divided by the total number of cells of that subset in the starting cell suspension, multiplying the results by 100. d-erythro-S1P was purchased from Avanti Polar Lipids. CCL19 and CXCL12 were purchased (R&D Systems). Fatty acid–free BSA was purchased from Sigma-Aldrich. Splenic CD4+ T cells or mature thymocyte CD4 (CD4+TCRβ+CD69−CD62L+) cells were seeded at 105 cells/100 μl loading medium (RPMI 1640, 10% FBS) into poly-d-lysine–coated 96-well black wall, clear-bottom microtiter plates (Nalgene Nunc). An equal volume of assay loading buffer (FLIPR calcium 4 assay kit; Molecular Devices) in HBSS supplemented with 20 mM HEPES and 2 mM probenecid was added. Cells were incubated for 1 h at 37°C before adding chemokine, and then the calcium flux peak was measured using a FlexStation 3 (Molecular Devices). The data were analyzed with SoftMax Pro 5.2 (Molecular Devices). Data are shown as fluorescent counts and the y-axis labeled as Lm1. The thymus and lymph node immunofluorescence was performed using a previously described method (20). Sections were immunostained with the Abs against CD3, CD4, CD8, and CD31 (all from eBioscience), LYVE-1 and CD169 (R&D Systems), UEA-1 (Vector Laboratories), and ER-TR7 (AbD Serotec) and agitated overnight at 4°C. Stained thick sections were microscopically analyzed by using a Leica SP5 confocal microscope (Leica Microsystems), and images were processed with Leica LAS AF software (Leica Microsystems) and Imaris v7.7.1 (×64) (Bitplane). For immunohistochemistry, freshly isolated thymuses from bone marrow–reconstituted mice were snap frozen in Tissue-Tek OCT compound (Sakura Finetek). Frozen OCT sections (7 μm) were acetone fixed for 2 min and dried at room temperature. Slides were rehydrated in TBS and stained in a humidified chamber in TBS/0.1% BSA/1% mouse serum overnight at 4°C or 1 h. The primary Abs used were against ER-TR7 (rat anti-mouse mAb, 1:400; BMA Biomedicals) and CD45.2 (biotinylated mouse mAb, 1:200; BD Biosciences). The primary Abs were detected with donkey anti-rat HRP-conjugated polyclonal Ab (1:200; Jackson ImmunoResearch Laboratories) and streptavidin conjugated to alkaline phosphatase (1:500; Jackson ImmunoResearch Laboratories), respectively. The HRP was revealed with diaminobenzidine (peroxidase substrate kit; Vector Laboratories), and alkaline phosphatase with Fast Blue/naphthol AS-MX phosphate (Sigma-Aldrich). Peroxidase block (Dako) or levamisole (Vector Laboratories) was used to block endogenous alkaline phosphatase and peroxidase activities, respectively. Purified splenic T cells from WT and G184S mice were labeled with 1 μM eFluor 450 or 2.5 μM 5-(and-6)-(((4-chloromethyl)benzoyl)amino)tetramethylrhodamine (CMTMR) for 15 min at 37°C and equal numbers of viable cells (8–10 million) were injected i.v. into recipient mice. After 2 h, spleen, inguinal lymph nodes, and popliteal lymph nodes were removed and gently dissociated into single-cell suspensions. Peripheral blood was collected by retro-orbital eye bleeding. After removing RBCs with Tris-NH4Cl, the cells were resuspended in PBS containing 1% BSA at 4°C. A Live/Dead fixable aqua dead cell stain kit (Thermo Fisher) was used to exclude dead cells. Data acquisition was done on a FACSCanto II flow cytometer and analyzed with FlowJo software (Tree Star). The egress assay used a similar initial approach, but 2 h after the CD4+ T cell transfer mice were injected i.v. with CD62L Ab (100 μg per mouse). After 18 h, spleen, inguinal lymph nodes, and popliteal lymph nodes were removed and gently dissociated into single-cell suspensions. Peripheral blood was collected by retro-orbital eye bleeding. After removing RBCs with Tris-NH4Cl, the cells were resuspended in PBS containing 1% BSA at 4°C. The ratios between the numbers of cells in the various compartments 2 h after transfer versus after CD62L Ab injection were calculated. Inguinal lymph nodes were prepared for intravital microscopy as described (25). Cell populations were labeled for 10 min at 37°C with 2 μM eFluor 450 (eBioscience), 2.5–5 μM CellTracker Red CMTMR (Molecular Probes). Five to 10 million labeled cells of each population in 200 ml of PBS were adoptively transferred by tail vein injection into 6- to 10-wk-old recipient mice. Inguinal lymph node was intravitally imaged from the capsule over a range of depths (10–220 μm). All two-photon imaging was performed with a Leica SP8 inverted five-channel confocal microscope (Leica Microsystems) equipped with a 0.95 numerical aperture (immersion medium used distilled water). Two-photon excitation was provided by a Mai Tai Ti:sapphire laser (Spectra Physics) with a 10-W pump, tuned to 810 or 910 nm. Emitted fluorescence was collected using a four-channel nondescanned detector. Wavelength separation was through a dichroic mirror at 560 nm and then separated again through a dichroic mirror at 495 nm followed by 460/50-nm emission filter for eFluor450 (eBioscience); a dichroic mirror at 650 nm followed by 610/60-nm emission filter for CMTMR; and the Evans blue signal was collected by a 680/50-nm emission filter. Sequences of image stacks were transformed into volume-rendered four-dimensional videos using Imaris software, and tracking analysis was transformed by using the autoregressive motion algorithm of Imaris software v7.7.1 (×64) (Bitplane). High endothelial venules (HEVs) were determined by cell attachment and a typical morphology of endothelium. Tracks were generated automatically with Imaris software and corrected manually with the spots function of Imaris software. Tracks represented cells that permanently adhered and underwent transendothelial migration (TEM) during 30 min of two-photon laser-scanning microscopy (TP-LSM) live imaging. Start points of all tracks were translocated on an arbitrary spot (gray spot) by the tracks translation function in Imaris software. Annotations on videos and video editing were performed using Adobe Premiere Pro CS3 (Adobe Systems). Video files were converted to an MPEG4 format with ImTOO Video Converter Ultimate 6.0.2 for MacIntosh (ImTOO Software Studio). WT and G184S-purified CD4+ T cells (negatively selected) were immunostained with CD4–Pacific Blue and CD45.2-PE or CD45.2-FITC to allow the genotypes to be distinguished. The cells were combined and rested in HBSS (1 mM CaCl2, 2 mM MgCl2, 1 mM MnCl2, and 0.5% fatty acid–free BSA) for 30 min prior to the ICAM-1 binding assay. The cells were unstimulated or stimulated with CCL19 (200 ng/ml; R&D Systems) for various time points in the presence of Alexa Fluor 647–conjugated ICAM-1/Fc chimera protein (ICAM-Fc; 1 μg/ml; R&D Systems, Thermo Fisher). For the ICAM-Fc binding–blocking experiment, the purified CD4+ T cells were preincubated with anti-CD11a (clone 2D7, 5 μg/ml; BD Biosciences) at 37°C for 10 min. Cells were fixed in 2% paraformaldehyde (Electron Microscopy Sciences) for 10 min on ice, washed, and ICAM-Fc binding was measured using flow cytometry by gating on the CD4+ cells. ICAM-Fc binding percentage was calculated as follows: 100 × [geometric mean fluorescence intensity (MFI) (each time point, incubation with CCL19) − geometric MFI (0 time point)]/geometric MFI (0 time point). The cells were lysed in RIPA buffer (Sigma-Aldrich) with 1 mM NaF, 1 mM PMSF, 1 mM DTT, and 1 mM Na3VO4 with complete and PhosSTOP inhibitors (Sigma-Aldrich). The lysates were separated by SDS-PAGE and transferred to nitrocellulose membranes by the iBLOT gel transfer system (Invitrogen). The membrane was incubated with 5% nonfat milk (w/v) in TBS buffer (25 mM Tris-HCl [pH 7.5], 150 mM NaCl, 0.1% Tween 20) for 1 h, and then reacted with the primary Ab in TBS buffer with 2.5% nonfat milk or 5% BSA (w/v) for overnight by shaking at 4°C. The appropriated second Abs conjugated to HRP were used to detect the protein of interest via ECL. The following primary Abs were used: phospho-p44/42 MAPK (Erk1/2) (Thr202/Tyr204) (E10) mouse mAb no. 9106, 1:2000; phosospho-Akt (Ser473) (D9E) XP rabbit mAb no. 4060, 1:2000; p44/42 MAPK (Erk1/2) Ab no. 9102, 1:1000; and Akt (pan) (11E7) rabbit mAb no. 4685, 1:1000 (all from Cell Signaling Technology). The secondary Ab for rabbit primaries was goat anti-rabbit IgG (H+L)–HRP conjugate no. 7074, 1:3000; and for the mouse primaries was horse anti-mouse IgG, HRP-linked Ab no. 7076, 1:3000 (all from Cell Signaling Technology). In vivo results represent samples from two to five mice per experimental group. Results represent mean values of at least triplicate samples. SEM and p values were calculated with a t test or ANOVA using GraphPad Prism (GraphPad Software). A p value <0.05 was considered statistically significant. The G184S thymuses were ∼25% smaller and they contained 30% fewer thymocytes than did those from WT mice. Immunophenotyping revealed a reduction in double-negative (DN) and double-positive thymocytes, yet SP CD4+ and CD8+ cells were increased, as were CD4+Foxp3+ cells (Fig. 1A, 1B). Among the DN cells, on a percentage basis the DN1 and DN3 subsets were reduced and the DN2 and DN4 subsets were slightly increased, whereas among the SP cells the immature cells were reduced and the mature cells were dramatically increased (Fig. 1C, 1D). We found similar numbers of γδ T cells. Because the Gαi2 G184S mutation affects all cell lineages, including thymic stromal cells, we reconstituted WT mice with bone marrow from WT or G184S mice. We found a similar phenotype as we had noted with the nonreconstituted mice (Fig. 1E). We also examined mixed bone marrow chimeric mice where we reconstituted CD45.2 mice with a 1:1 mixture of CD45.2 (WT) and CD45.1 (G184S) bone marrow. In these mice the DN and double-positive compartments contained an increased percentage of WT cells, whereas in the mature SP compartments most cells were of G184S origin. The WT and G184S bone marrow contributed equally to the number of γδ T cells; however, the thymic CD4+Foxp3+ cells were more likely to be of G184S mouse origin (Fig. 1F). Thus, G184S thymocyte precursors reach the thymus where they generate SP thymocytes; however, mature SP thymocytes accumulate in the thymus. Reduced numbers of thymocytes and altered thymocyte subsets in G184S mice. (A) Flow cytometry analyzing the expression of CD4 and CD8 on thymocytes, CD69 and CD62L on SP thymocytes, and CD44 and CD25 on DN thymocytes from WT and G184S mice. (B) Cell numbers calculated from flow cytometry results analyzing thymocytes prepared from WT and G184S mice. The γδ T cells were CD3+TCRγδ+NK1.1−CD11c− and the CD4 Foxp3+ cells were CD4+CD8− and Foxp3+ by intracellular staining. (C) Percentages of DN1–DN4 cells from WT and G184S mice. (D) Number of mature and immature SP thymocytes from WT and G184S mice. (E) Cell numbers calculated from flow cytometry analyzing thymocytes prepared from mice reconstituted 6 wk previously with bone marrow from WT or G184S mice. (F) The percentage of thymocyte populations of WT or G184S origin from mice reconstituted with a 1:1 mix of CD45.1 (WT) and CD45.2 (G184S) bone marrow. (A) n = 4 versus 4 mice, representative flow patterns; (B) n = 4 versus 4 mice; (C) n = 4 versus 4 mice; (D) n = 4 versus 4 mice; (E) n = 4 versus 4 mice; (F) n = 3 mice. Experiments were performed a minimum of three times. *p < 0.05, **p < 0.005, ***p < 0.0005 (Student t test). In nonreconstituted G184S mice (data not shown) and mice reconstituted with G184S bone marrow, there was reduction of CD4+ and CD8+ T cells in the blood, spleen, lymph nodes, and Peyer’s patches. In general, the peripheral CD4+ T cell compartment was more severely depleted than the CD8+ T cell compartment (Fig. 2A). In mixed bone marrow chimera mice ∼70% of the blood and lymphoid organ CD4+ T cells were of WT origin (Fig. 2B, 2C). The bias toward WT cells was more severe in the T follicular helper and regulatory T cells, which were 85% WT origin (Fig. 2D). T cell lymphopenia and reduced numbers of peripheral T cell in the G184S mice. (A) Cell numbers from flow cytometry analyzing expression of CD4 and CD8 on cells isolated from the blood, spleen, inguinal lymph node (iLN), mesenteric lymph node (mLN), and Peyer’s patches (PP) from mice 7 wk after bone marrow reconstitution with either WT or G18S4 bone marrow. (B) The percentage of CD4+ or CD8+ cells of WT or G184S origin in the blood, spleen, iLN, mLN, or PP of mice previously reconstituted with a 1:1 mix of CD45.1 (WT) and CD45.2 (G184S) bone marrow. (C) The percentage of CD4+Foxp3+ and CD4+CXCR5+PD-1+ of WT or G184S origin in the blood, spleen, iLN, mLN, or PP of mice previously reconstituted with a 1:1 mix of CD45.1 (WT) and CD45.2 (G184S) bone marrow. (D) The ratio between WT and G184S derived CD4+, CD4+Foxp3+, and CD4+CXCR5+PD-1+ from all examined sites. Tfh, T follicular helper cell; Treg, regulatory T cell. (E) Flow cytometry analyzing CD44 versus CD62L on CD4+ blood cells from mice reconstituted with either WT or G184S bone marrow. Shown to the right is the ratio between memory and naive cells in the blood. (F) Flow cytometry analyzing CD44 versus CD62L on CD4+ spleen cells from mice reconstituted with either WT or G184S bone marrow. (A) n = 5 versus 5 mice; (B) n = 4 mice; (C) n = 4 mice; (D) n = 4 mice; (E) n = 5 versus 5 mice, representative flow pattern; (F) n = 5 versus 5 mice, representative flow pattern. All experiments were performed a minimum of three times. *p < 0.05, **p < 0.005, ***p < 0.0005 (Student t test). CD44, CD62L, CD24, and CD45RB have been used to characterize naive, central memory, and effector memory cells (26). We compared blood from WT mice reconstituted with either WT or G184S bone marrow. As expected, both sets of mice had an increase in memory CD4+ T cells, as bone marrow reconstitution leads to a homeostatic expansion of naive cells that adopt a memory phenotype (27). However, when we compared the ratios between memory (CD44highCD62Llow) and naive cells (CD44lowCD62Lhigh), we found that the blood from the mice reconstituted with WT bone marrow had a memory/naive CD4+ T cell ratio of 6, whereas the G184 bone marrow–reconstituted mice had a ratio of nearly 120 (Fig. 2E). Of note, the CD62LhighCD44very low cells were also severely depleted in the blood of the G184S-reconstituted mice compared with the WT mice (Fig. 2E). In the spleen, the memory/naive CD4+ T cell ratio was also skewed, although not as severely as in the blood (Fig. 2F). The failure to restore T cell numbers to normal in the G184S mice argues that either the thymic egress defect is particularly egregious, or there is an additional defect in homeostatic T cell expansion or cell survival in these mice. To investigate the chemotactic response of WT and G184S splenic T cells and thymocytes, we first used CD45.1 WT mice reconstituted with a 1:1 mix of WT (CD45.1) and G184S (CD45.2) bone marrow. This allowed a direct comparison of their migration potential. When corrected for nonspecific migration there was an ∼60% reduction in the specific response of splenic G184S CD4+ and CD8+ cells to CXCL12 and CCL19 at the highest ligand concentrations (Fig. 3A). We also tested the responses of naive and memory CD4 T cells to CXCL12 and CCL19. Splenic CD4 T cells from either WT or G184S bone marrow–reconstituted mice were immunostained for CD44 and CD62L and subjected to a chemotaxis assay. Both the naive (CD44lowCD62Lhigh) and the CD44highCD62Llow (memory) populations from the G184S mice responded less well to optimal concentrations of CXC12 and CCL19 (Fig. 3B). As expected, both the WT and G184S mature thymocytes responded poorly to CXCL12; however, the mature G184S thymocytes responded less well to CCL19 (30–40% reduction) compared with WT cells (Fig. 3C). Decreased responsiveness of G184S splenic T cells and SP thymocytes to chemokines. (A) Migration assay to assess response of splenic T cells from mice previously reconstituted with a 1:1 mix of CD45.1 (WT) and CD45.2 (G184S) bone marrow. Data are expressed as percentage migrated in a 2-h assay in response to increasing concentrations of the CXCL12 or CCL19. (B) Migration assay to assess response of memory and naive CD4 T cells isolated from splenocytes prepared from WT or G184S bone marrow–reconstituted mice. Data are expressed as percentage migrated in a 2-h assay in response to increasing concentrations of the CXCL12 or CCL19. (C) Migration assay to assess response of mature thymocytes from mice previously reconstituted with a 1:1 mix of CD45.1 (WT) and CD45.2 (G184S) bone marrow. Data are expressed as percentage migrated in a 2-h assay in response to increasing concentrations of the CXCL12 or CCL19. (D) Basal and peak intracellular calcium levels of WT or G184S splenic CD4+ T cells in response to increasing concentrations of CCL19. Data are plotted as peak calcium versus log concentration of CCL19. (E) Kinetics of the intracellular calcium levels following stimulation of WT and G184S mature thymocytes with CCL19 (100 ng/ml). (F) Immunoblot of cell lysates prepared from WT and G184S splenic CD4+ T cells stimulated with CCL19 (200 ng/ml) to analyze pERK and pAKT levels at various time points. The ratio between the phosphorylated and unphosphorylated versions for each time point is shown below. (G) Flow cytometry to assess pERK and pAKT levels following the exposure of mature WT and G184S CD4+ thymocytes to CCL19 (200 ng/ml). (A) n = 3 mice; (B) n = 3 versus 3 mice, duplicate determination; (C) n = 3 mice; (D) n = 3 versus 3 mice, duplicate determinations; (E) n = 1 versus 1, duplicate determinations; (F) n = 1 versus 1 mice; (G) n = 3 versus 3 mice, duplicate determination. All experiments were performed a minimum of three times. *p < 0.05, **p < 0.005, ***p < 0.0005 (Student t test). Although chemotaxis depends on the release of βγ subunits from Gαi (28, 29), another measure of βγ signaling is to assess the activity of its downstream effectors. For example, freed βγ subunits activate phospholipase C-β2, leading to chemokine-induced increases in intracellular calcium (30). We found that splenic G184S T cells had a slight increase in their basal intracellular Ca2+ level (Fig. 3D, left panel). Plotting the peak intracellular Ca2+ level versus CCL19 dose revealed a reduced peak intracellular Ca2+ response in the G184S CD4+ T cells (Fig. 3D, right panel). Similarly, mature G184S CD4+ thymocytes had a subnormal peak response. The time-dependent changes in intracellular calcium in WT versus G184S mature CD4+ thymocytes following exposure to CCL19 are shown in Fig. 3E. Freed βγ subunits also activate MAPKs via c-Src activation and AKT via the activate PI3Ks (31). To assess the status of these pathways, we immunoblotted pAKT and pERK using cells lysates from CD4+ T cells prior to, and following, CCL19 stimulation. Stimulated WT splenic T cells had a transient increase in pERK that peaked at 1 min whereas G184S cells had a delayed response that persisted longer. The pAKT response declined rapidly in the WT T cells, but more slowly in the G184S T cells (Fig. 3F). To investigate the pAKT and pERK responses in mature thymocytes, we used flow cytometry to measure intracellular staining with pAKT- and pERK-specific Abs. Following stimulation with CCL19 we found a small reduction in the pAKT response at 1 and 5 min, but no difference in the pERK responses when compared with WT mature CD4+ thymocytes (Fig. 3G). 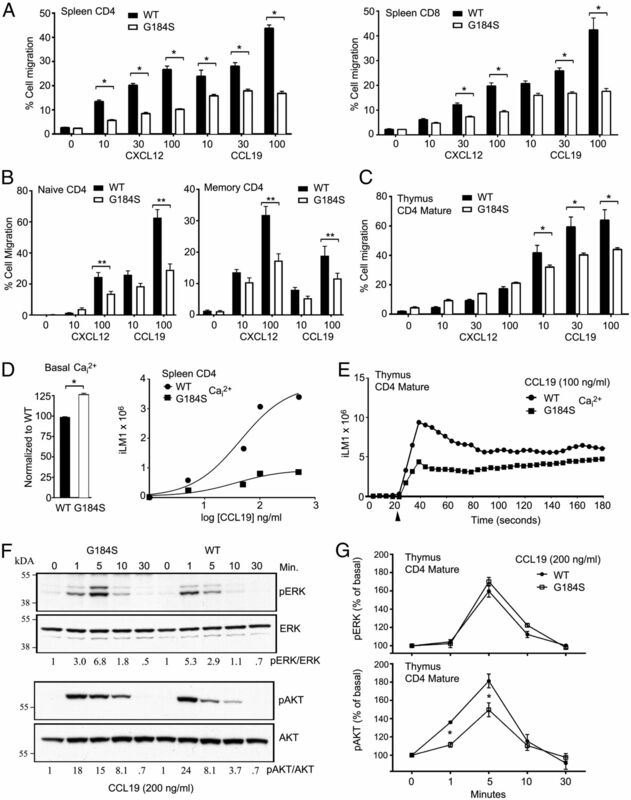 These data indicate the G184S T cells and thymocytes exhibit defects in CCL19-induced chemotaxis and effector activation. An in vivo measure of lymphocyte chemokine receptor signaling is the efficiency at which lymphocytes cross HEVs and enter lymph nodes (32). For adoptive transfer experiments, we used nonreconstituted mice and enriched for naive splenic CD4+ T cells by using the following Abs for negative selection: CD8, CD11b, B220, CD11c, Ter119, c-Kit, CD44, and Gr-1. We verified that the purified cells were CD4+ T cells and that they expressed the major homing receptors. However, we noted a very slight reduction in CD62L and CCR7 levels on the purified G184S cells whereas CXCR4, CD49d, and CD11a were similar to WT cells (data not shown). Next, we adoptively transferred differentially labeled WT and G184S CD4+ T cells into WT mice. Two hours later we measured their relative proportion in the blood, spleen, and peripheral lymph nodes. This analysis showed a 40–50% reduction in the G184S naive CD4+ T cells in the lymph nodes when compared with the WT cells, and an increased percentage in the blood. These results reveal a significant homing defect (Fig. 4A). To identify the defect, we intravitally imaged adoptively transferred WT and G184S naive CD4+ T cells in the HEVs of the inguinal node (Supplemental Video 1). Imaging at various time points following the transfer revealed fewer G184S CD4 T cells localized on the HEVs (Fig. 4B). The imaging also revealed that the G184S CD4+ T cells took nearly five times longer to find TEM sites than did WT cells (Fig. 4C, 4D). The G184S CD4+ T cells often failed to quickly firmly adhere, slipping along the lumen of the HEV before eventually finding a TEM site or disappearing from the imaging field. However, once the cells commenced transmigration, the average TEM times did not differ (Fig. 4D). Impaired G184S CD4+ T cell homing to and localization in the inguinal lymph node. (A) Quantification of flow cytometry results analyzing the location of WT and G184S CD4+ T cells 2 h after adoptive transfer into WT mice. To enrich for naive CD4 T cells, a CD44 Ab was added to the negative selection. The absolute numbers of cells in the blood, spleen, inguinal lymph node (iLN), and popliteal lymph node (pLN) are shown. Results are from the three separate adoptive transfers. Experiment was repeated twice with similar results. *p < 0.05 (Student t test). (B) Analysis of cell populations in the HEV at various time points from 10 to 60 min after cell transfer into the tail vein. Percentage of each population of the total, which firmly adhered in the HEV at indicated time point, is shown. (C) TP-LSM imaging of the HEV (left panel) at 10 min after WT (blue) and G184S (green) CD4+ T cell transfer. Blood vessels are visualized with Evans blue (red). Scale bar, 20 μm. Representative tracks of WT (green) and G184S (red) CD4+ T cells in the HEV (middle panel). Scale bar, 20 μm. A comparison of generated tracks of WT (green) and G184S (red) (right panel) is shown. Start points of all tracks were translocated on an arbitrary spot (gray spot). Grid spacing is 10 μm. (D) Statistical analysis of tracks from (C). Track length (WT, 22.19 ± 5.679 μm; G184S, 105.40 ± 9.492 μm; n = 6, p < 0.0001); displacement (WT, 7.060 ± 0.7592 μm; G184S, 51.00 ± 9.180 μm; n = 6, p = 0.0008); track duration (WT, 1.602 ± 0.3649 min; G184S, 5.357 ± 0.7300 min; n = 6, p = 0.001); TEM time (WT, 40.42 ± 1.787 s; G184S, 45.56 ± 4.329 s, n = 9). (E) Flow cytometry to assess the binding of ICAM-Fc to WT and G184S splenic CD4+ T cells following the exposure to CCL19 for various durations. Differentially labeled purified CD4+ T cells (CD44low) from WT and G184S mice were stimulated or not with CCL19 (200 ng/ml) in the presence of Alexa Fluor 647–conjugated ICAM-Fc (1 μg/ml). For the ICAM-Fc binding–blocking experiment, purified CD4 T cells were preincubated with CD11a. At the indicated time points the cells were fixed, washed, and ICAM-Fc binding was measured via flow cytometry (the graph shows the data from the early time points, whereas the 30-min time point for the flow cytometry profiles is shown). ICAM-Fc binding percentage was calculated as follows: 100 × [geometric MFI (each time point, incubation with CCL19) − geometric MFI (0 time point)]/geometric MFI (0 time point). The experiment was performed four times with CD4+ T cells from one WT and one G184S mouse. (F) TP-LSM imaging of the cortical ridge close to the HEVs (left panel) at 3 h after WT (blue) and G184S (green) CD4+ T cell transfer. Blood vessels were visualized with Evans blue (red). Statistical analysis of cell numbers in the cortical ridge (right panel) is shown. Cell numbers were counted with images of six different cortical ridges (WT, 28.84 ± 2.033; G184S, 75.16 ± 2.033; n = 6). As T lymphocytes transit lymph node HEVs they have only a few seconds following chemokine exposure to firmly adhere to the vessel endothelium to avoid being swept away by the bloodstream. An impairment in rapid integrin activation would explain the decreased adherence of the G184S T cells to the HEVs. To assess the kinetics of ICAM-1 binding to WT and G184S CD4+ T cells, we added CCL19 simultaneously with fluorescently labeled ICAM-Fc to a 1:1 mix of differentially labeled WT and G184S naive CD4+ T cells. At various time points the cells were fixed to terminate further ICAM-Fc binding. We assessed the amount of ICAM-Fc bound by flow cytometry. As controls we added ICAM-Fc in the absence of CCL19 and in some instances preincubated the cells with an LFA-1–blocking Ab prior to the addition of chemokine and ICAM-Fc. We found in the absence of chemokine only a low level of ICAM-Fc binding, and the addition of the LFA-1–blocking Ab blocked ICAM-Fc binding in the presence of chemokine. At the early time points we found a significant reduction in the ICAM-Fc binding to the G184S cells; however, by the later time points the amount of ICAM-1 bound was similar and eventually exceeded that of WT cells (Fig. 4E). Thus, the proper kinetics of CCL19-induced integrin activation depend on Gαi2/RGS protein interactions. Once CD4+ T cells cross HEVs they rapidly migrate away from the cortical ridge region to enter the deep lymph node cortex (Supplemental Video 2). When we compared the adoptively transferred WT and G184S naive CD4+ T cells that had entered into the lymph node, we found that most G184S CD4+ T cells remained in close proximity to the cortical ridge, failing to access the deep T cell cortex (Fig. 4F). CD4+ T cells lacking Gαi2 also remain localized near the cortical ridge following adoptive transfer (33). Taken together, these data indicate that the loss of Gαi2/RGS protein interactions alters the kinetics and magnitude of chemokine receptor signaling, and as a physiologic consequence decreases CD4+ T cell chemotaxis, reduces firm adhesion to HEVs, resulting in impaired lymph node homing, and alters the positioning of the cells within the lymph node. The S1P/S1PR1 axis is critical for normal thymocyte egress and T lymphocyte trafficking (2). In the thymus this axis controls thymocyte reverse transmigration into the blood, and in lymph nodes it controls lymphocyte migration into the efferent lymphatics. Because the G184S mice exhibited a phenotype consistent with a defect in S1PR1 signaling, we initially assessed receptor expression. Flow cytometry with an S1PR1-specific Ab and CD69 revealed that the G184S cells expressed S1PR1 at levels similar to those of WT cells (Fig. 5A). CD69 downregulation occurred normally (Fig. 5B), indicating endogenous S1P signaling and migratory responses were intact and even better than WT with 10 nM S1P (Fig. 5C). S1P elicited a good intracellular calcium response in the mature CD4+ thymocytes (Fig. 5D) and induced pAKT (Fig. 5E). Although we noted some variability in pAKT responses, there was no consistent increase or decrease in the G184S mature CD4+ thymocytes versus the WT cells. S1P also induces the dephosphorylation of ezrin/radixin/moesin proteins via a pertussis toxin–dependent pathway (23). Whereas the G184S CD4+ mature thymocytes had a higher basal level of pERM expression, exposure to S1P led to a robust reduction (Fig. 5F). Finally, although impaired S1PR1 receptor internalization can adversely affect signaling (34), we found no difference between WT and G184S thymocytes (Fig. 5G). Unimpaired responsiveness of G184S splenic T cells and SP thymocytes to S1P. (A) Flow cytometry analyzing CD69 and S1PR1 expression on lymph node CD4+ T cells and CD4+ SP thymocytes from mice reconstituted with either WT or G184S bone marrow. (B) Quantification of flow cytometry results showing expression of CD69 on immature and mature CD4+ SP thymocytes from WT and G184S bone marrow–reconstituted WT mice. (C) Migration of spleen T cells and mature thymocytes to increasing concentrations of S1P in a Transwell assay. The basal migration in the absence of S1P is subtracted from that in the presence of S1P. The WT and G184S thymocytes were distinguished on the basis of CD45.1/2 immunostaining. (D) Time-dependent change in intracellular calcium following exposure of mature CD4+ SP thymocytes to 100 (above) or 10 nM (below) concentration of S1P. (E) Intracellular flow cytometry to assess the levels of pERK and pAKT following exposure of mature CD4+ SP thymocytes to 1, 10, or 100 nM S1P. The thymocytes were prepared from bone marrow–reconstituted mice and stimulated for the indicated durations. (F) Intracellular flow cytometry to analyze pERM levels following a 5-min exposure to 100 nM S1P. (G) Flow cytometry analysis of S1PR1 expression on mature CD4+ thymocytes from WT and G184S mice following a 30-min exposure to increasing concentrations of S1P. (A) n = 1 versus 1 mice, from analysis of three versus three mice; (B) n = 2 versus 2 mice, performed three times; (C) n = 3 versus 3 mice, performed three times; (D) n = 1 versus 1 mice, performed three times; (E) n = 2 versus 2 mice, performed twice; (F) n = 1 versus 1 mice, representative flow pattern of three experiments; (G) n = 2 versus 2 mice, performed four times. *p < 0.05, **p < 0.005, ***p < 0.0005 (Student t test). To determine whether the G184S T cells also had a defect in lymph node egress, we simultaneously adoptively transferred WT and G184S naive CD4+ T cells to WT mice and allowed them to home to lymph nodes, before blocking further lymphocyte entrance using an Ab against CD62L. Eighteen hours later we determined the number of transferred cells in the lymph nodes, spleen, and blood of the recipient mice (Supplemental Fig. 1A). When corrected for the impaired initial homing, a lymph node egress defect became apparent (Supplemental Fig. 1B). We also examined the localization of WT and G184S CD4+ T cells 18 h after adoptive transfer into WT mice. Because of the poor homing of the G184S CD4+ T cells, we transferred twice as many G184S CD4+ T cells as WT. By immunostaining thick lymph node sections we quantitated the numbers of WT and G184S CD4+ T cells within 20 μm of cortical and medullary lymphatics, as well as within their lumens (Supplemental Fig. 1C, 1D). We found more G184S CD4+ T cells near the efferent lymphatics, although their numbers within the lymphatics were reduced. The ratio between those cells close to the lymphatics and those within the lumen suggest that many G184S CD4+ T cells were well positioned to exit, but that they had difficulty in doing so. Of note, the number of G184S CD4 T cells localized in the spleen was increased 18 h after adoptive transfer as compared with WT CD4 T cells. This may reflect the increased sensitivity of the G184S CD4 T cells to S1P, as was observed with GRK2−/− CD4 T cells, which also accumulated in the spleen (23). Mature thymocytes exit the thymus via blood vessels at the corticomedullary junction (35). Neural crest–derived pericytes and endothelial cells provide the S1P that promotes thymic egress (36, 37). To assess the localization of the mature G184S thymocytes, we examined thymus sections from mice reconstituted with WT or G184S bone marrow immunostained with Abs that recognize CD3, CD4, CD8, and UEA-1. The UEA-1 Ab delineates the thymic medullary epithelial cells. The G184S sections had more extensive UEA-1 immunostaining (Fig. 6A). Consistent with an egress defect, we noted a marked increase in CD3high cells in the medullary region of the G184S thymuses. Immunostaining thymuses from CD45.1 mice previously reconstituted with a 1:1 mix of CD45.1 and CD45.2 WT bone marrow, or with a 1:1 mix of CD45.1 WT and CD45.2 G184S bone marrow for expression of CD45.2 and ER-TR7, which delineates cells associated with endothelial and epithelial basement membranes (35), revealed the preferential accumulation of the G184S thymocytes near the egress sites (Fig. 6B). Quantitating the ratio between the CD45.2 and CD45.1 cells in contact ER-TR7–immunostained blood vessels at the cortex/medullary junction revealed a 4-fold higher ratio in the mice that received the 1:1 mix of WT and G184S bone marrow. To visualize the mature thymocytes in relationship to the thymic vessel perivascular channel (PVC), we immunostained thymuses from mice reconstituted with WT or G184S bone marrow with Abs against CD4, CD3, ER-TR7, and CD31. Numerous mature G184S thymocytes localized in the PVC in the G184S thymus sections whereas many fewer WT thymocytes did so in the WT sections (Fig. 6C). Measuring the average cell diameter thickness in the PVC of the thymic egress vessels in the G184S mice versus that of WT mice revealed an average thickness of 2.8 ± 0.3 cell diameters in the PVC of the G184S mice and 0.5 ± 0.1 cell diameters in the PVC of the WT mice. These results indicate that G184S mature thymocytes access the egress sites, but many fail to transmigrate into the blood. The difficulty in thymocyte transmigration into the blood observed in the G184S mice is thymocyte intrinsic, independent of expression of the G184S Gαi2 mutation in endothelial cells or pericytes. Expanded thymus medullary region and the accumulation of mature thymocytes in the PVCs of the corticomedullary blood vessels. (A) Tiled confocal microscopy of the thymus of WT mice reconstituted with either WT or G184S bone marrow previously immunostained for CD3 (blue), CD4 (green), CD8 (red), and UEA1 (white). Scale bars, 400 μm. Shown below is the UEA1 signal in the absence of the others. The number of white pixels in each image is indicated. (B) White field microscopy of the thymus of WT mice reconstituted with either WT (CD45.1 and CD45.2) (left panels) bone marrow or with WT (CD45.1) plus G184S (CD45.2) (right panels). The thymic sections were immunostained for CD45.2 (blue) and ER-TR7 (brown). The images below are 2.7-fold zoomed-in regions from those indicated in the top images. Scale bars, 100 μm. The ratio between CD45.2 and CD45.1 cells in contract with putative egress vessels at the corticomedullary junction is indicated below each image. (C) Confocal microscopy of the thymus from either a WT or a G184S bone marrow–reconstituted mouse immunostained to delineate the T cell egress sites by anti-CD31 (endothelial cells of blood vessels, red) and anti–ERTR-7 (reticular cells layers of perivascular sheet, green) Ab. T cells were visualized by CD4 (blue) and CD3 (pink) Ab (upper panels). Representative egress sites of WT (left) and G184S (right) thymuses are shown. White arrows (right panel) indicate PVC distended by G184S T cells. Lower panels were presented without CD3 staining. Scale bars, 100 μm. Despite reduced thymic output, homeostatic mechanisms often restore the number of peripheral T cells into the normal range. Homeostatic maintenance of the naive T cell pool depends on contact with peptide/MHC molecules and IL-7 receptor signaling (27). Contact with these survival signals typically occurs in secondary lymphoid organs such as lymph nodes and in the spleen (38, 39). We found no defect in TCR signaling in CD4+ T cells prepared from G184S bone marrow–reconstituted mice. Stimulation with anti-CD3 with or without anti-CD28, or the two Abs plus IL-2, revealed that a greater percentage of the G184S bone marrow–derived cells divided, and those cells that divided proliferated to a greater extent than did similarly stimulated cells from control mice (Fig. 7A). These results were confirmed when we tested CD4+ T cells from mixed bone marrow chimeric mice (Fig. 7B). To determine whether the altered proliferative responses were secondary to changes in the memory/naive cell pools of the G184S mice, we sorted splenic CD4 T cells from both strains using naive and memory CD4 T cell markers. We dye-labeled the cells and stimulated them with CD3/CD28 in the presence or absence of IL-2. The G184S naive CD4 T cells stimulated with CD3/CD28 both in the presence or absence of IL-2 responded better than did the WT cells (Fig. 7C, left and middle panels). Although the G184S memory CD4 T cell response was also increased following CD3/CD28 stimulation, the addition of IL-2 led to similar responses (Fig. 7C, right panel). Following CD3/CD28 crosslinking, both the WT and G184S CD4+ T cells downregulated TCRβ and CD62L and upregulated CD25 and CD44, although the G184S cells expressed higher levels of CD25 and CD44 (Fig. 7D). Consistent with the proliferation data at 4 d following stimulation, we recovered more G184S than WT CD4+ T cells (Fig. 7E). Responses of G184S CD4+ T cells to TCR and IL-7 receptor engagement are intact. (A and B) CSFE dilution assays to determine the percentage of cells that divided and to calculate a proliferation index using CD4+ T cells purified from either WT or G184S bone marrow–reconstituted mice (A) or from mixed bone marrow chimeric mice reconstituted with a 1:1 of WT and G184S bone marrow (B). The cultures were stimulated with various combinations of anti-CD3, anti-CD28, and IL-2 as indicated for 96 h. (C) CSFE dilution assays to determine the percentage of cells that divided using splenocytes purified from either WT or G184S bone marrow–reconstituted mice and sorted for CD4+CD44lowCD62Lhigh (naive, left panel) or CD4+CD44highCD62Llow (memory, right panel). The cells were stimulated as indicated for 96 h and the percentage of divided cells was determined. A representative dye dilution profile of the WT and G184S naive CD4 T cells stimulated with anti-CD3, anti-CD28, and IL-2 is shown in the middle panel. (D) Flow cytometry results from the analysis of CD4+ T cells prepared from WT and G184S bone marrow–reconstituted mice and stimulated with anti-CD3 and anti-CD28 for 96 h for the expression of the indicated markers. (E) Recovery of CD3- and CD28-stimulated CD4+ T cells prepared from the spleens of WT or G184S bone marrow–reconstituted mice at day 4 of culture. The initial cultures contained 5 × 105 cells. (F) Flow cytometry to assess IL-7 receptor expression on WT and G184S CD4+ T cell subsets. WT and CD4+ T cells from WT and G184S mice were incubated with or without IL-7 (10 ng/ml) for 24 h prior to measuring IL-7R expression on CD4+ T cell subsets delineated by expression of CD44 and CD62L. (A) n = 5 versus 5 reconstituted mice; (B) n = 4 for 1:1 mix–reconstituted mice; (C) n = 3 versus 3 reconstituted mice; (D) n = 4 versus 4 reconstituted mice; (E) n = 4 versus 4 reconstituted mice; (F) n = 5 versus 5 reconstituted mice. All experiments were performed a minimum of two times. *p < 0.05, **p < 0.005, ***p < 0.0005 (Student t test). To assess the IL-7/IL-7R axis, we first checked that IL-7 receptor expression profiles of blood G184S and WT naive, memory, and effector memory T cells were similar (data not shown). Because IL-7–induced signaling depends on IL-7Rα internalization and subsequent receptor degradation (40), we measured IL-7R expression of various cell subsets following culture in the presence or absence of IL-7. In the absence of IL-7 we found a slight increase in IL-7 receptor expression on the CD44high subsets from the mice reconstituted with G184S bone marrow as compared with WT. We found a similar downregulation of the receptor after the exposure of WT and G184S CD4+ T cell subsets to IL-7 (Fig. 7E). These results suggest that TCR and IL-7 receptor signaling are not compromised in the G184S mice. The loss of an interaction between Gαi2 and RGS proteins led to severe defects in thymocyte egress and peripheral T cell trafficking despite normal Gαi3/RGS protein interactions. Peripheral G184S T cells and mature thymocytes had suboptimal responses to chemokines. Nevertheless, mature G184S thymocytes localized in the medullary region near thymic egress sites. Despite the engagement of S1PR1 and ostensibly normal S1P signaling, the mature thymocytes accumulated in the PVCs of the egress blood vessels. The thymus egress defect led to a reduction of CD4+ and to a lesser extent CD8+ T cells in the blood, lymph nodes, Peyer’s patches, and spleen. Homeostatic mechanisms did not restore peripheral T cell numbers perhaps due to aberrant cell trafficking, as TCR and IL-7R signaling were unimpaired. Imaging the G184S T cells in the lymph node revealed an entry defect secondary to impaired firm adhesion, a positioning defect, and an egress defect. 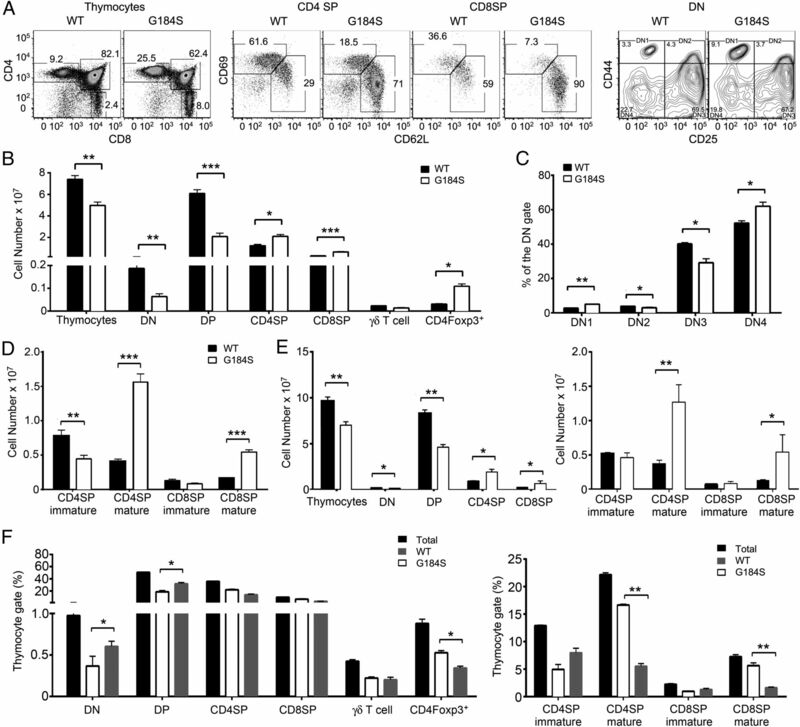 As thymocytes mature they shift from the thymus cortex to the medulla as CCR4- and CCR7-dependent recruitment signals overcome CXCR4-dependent retention signals. Once in the medulla, thymocytes acquire S1PR1, downregulate CD69, and upregulate CD62L (41). The detection of S1P emanating from egress sites reduces CD69 expression and triggers thymocytes to enter into PVCs and to reverse transmigrate into the blood. Loss of local S1P production, disruption of the S1P gradient, or loss of S1PR1 blocks mature thymocyte egress (2). 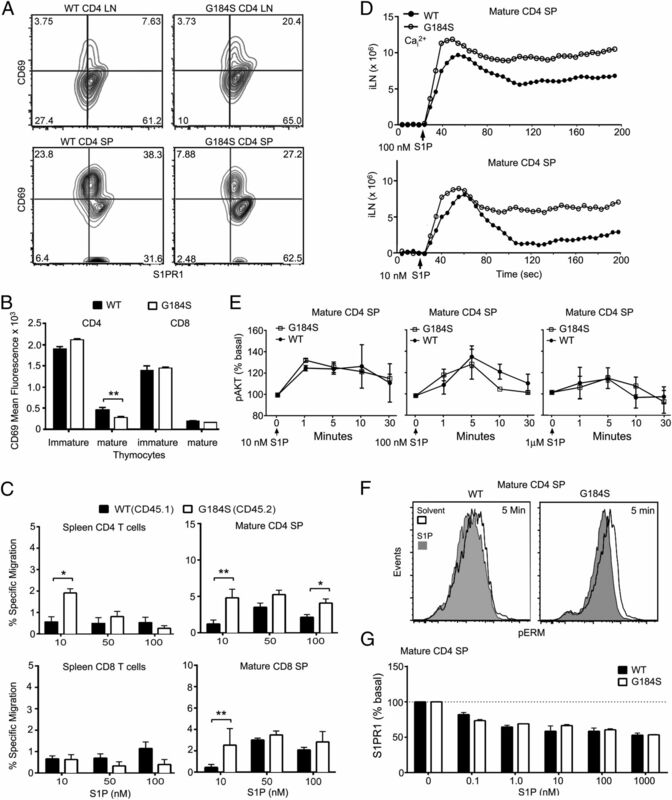 Directly implicating S1PR1 signaling and chemotaxis in thymocyte egress, thymocytes lacking the protein kinases NDR1 and NDR2 have impaired S1P responses and an egress defect (42). Surprisingly, despite intact S1P-mediated chemotaxis and apparently uncompromised S1PR1 signaling, the G184S thymocytes also have an egress phenotype. The mature G184S thymocytes lodged in the PVCs of the egress vessels, arguing that initial S1P signaling had occurred, as this step is allegedly S1PR1-dependent (35). Only the final reverse transmigration step across the endothelial basement membrane and endothelium was adversely affected. This implies a direct role for RGS proteins/Gαi2 interaction in promoting this final step. Given that S1PR1 prefers to couple to Gαi3 (20), which in these mice is subject to normal RGS protein regulation, and given that S1P signaling was minimally affected, then why do the mature thymocytes reverse transmigrate so poorly? An attractive possibility is that many of the G184S thymocytes in the PVC are stuck, such that S1P signaling is unable to trigger their entrance into the blood. RGS proteins may normally function to attenuate Gαi2 signaling in the PVC, thereby limiting thymocyte adhesion to PVC structures, allowing S1P/Gαi3 signaling to promote reverse transmigration. Supporting this idea, RGS proteins can attenuate chemoattractant adhesive signaling as well as preferentially target specific Gα subunits or receptors (43, 44). Consistent with a differential role for Gαi2 versus Gαi3 in the control of cell adhesion and cell migration, a recent study showed that CXCR2-triggered neutrophil arrest depended more on Gαi2 than Gαi3, whereas the converse held for CXCR2-mediated chemotaxis (45). 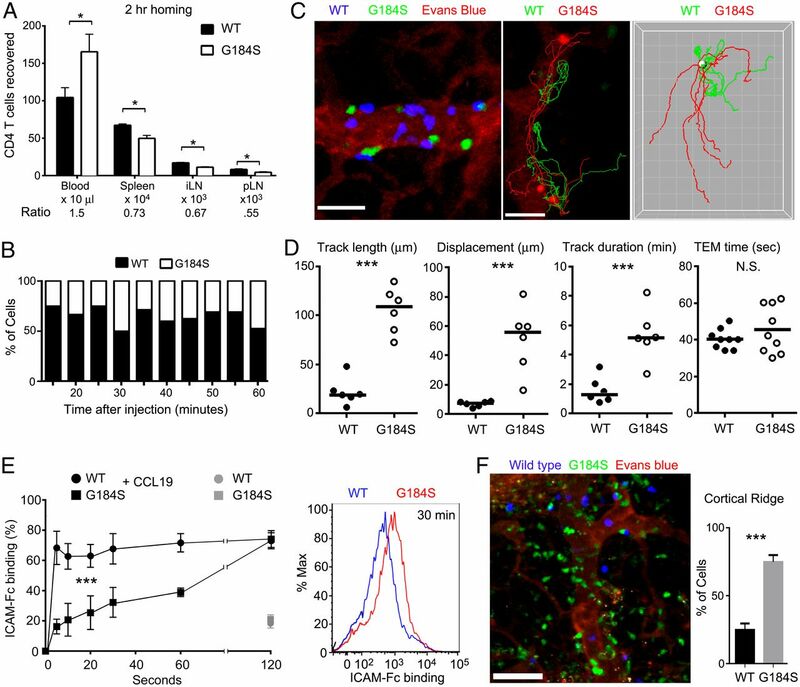 An alternative and, in our mind, less likely explanation for the G184S thymocyte phenotype is an impairment of a Gαi2-dependent signaling pathway needed for reverse transmigration. Intriguingly, similar to the G184S mice, mice with T cell–specific dynamin 2 deficiency have a thymus egress defect and T cell lymphopenia (34). The lack of dynamin 2 led to decreased S1PR1 internalization at low ligand concentrations and elevated CD69 levels, but normal S1P-triggered chemotaxis. The authors concluded that dynamin 2 was necessary for receptor recycling, which allowed mature thymocytes to respond to the low S1P concentrations. As S1PR1 internalization does not depend on Gαi nucleotide exchange (34), and because receptor internalization occurred normally in the G184S mice, a problem at the level of the receptor in the G184S thymocytes seems unlikely to explain the retention phenotype. The severe T cell leukopenia in the mice with a T cell–specific dynamin 2 deficiency resulted not only from a thymocyte egress defect, but also from an inability to sustain TCR signaling due to defective TCR internalization (46). This led to metabolic reprogramming of the T cells and poor cell proliferation. In contrast, the G184S T cells proliferated better in vitro than did WT CD4+ T cells following either TCR or TCR/CD28 crosslinking. This was not a consequence of an alteration in the naive/memory CD4 T cell pools, as the phenotypically naive G184S CD4 T cells also responded better. Thus, a reduced sensitivity of the naive G184S CD4 T cells to TCR or coreceptor signaling seems unlikely to account for the CD4+ T cell leukopenia in these mice. As the maintenance of the peripheral CD4+ T cell pool also depends on IL-7 receptor signaling, which the cells receive during lymphoid organ trafficking (27), we also assessed IL-7 receptor signaling; however, it did not differ from control mice. Nevertheless, the decreased CD4+ T cell trafficking through lymphoid organs may limit their exposure to these homeostatic signals and contribute to the observed CD4+ T cell lymphopenia. The reason for the enhanced in vitro responsiveness of the CD4 G184S T cells to TCR signal and TCR/CD28 signals is unknown. Consistent with the T cell data, we also noted an increase in the percentage of G184S B cells that divided in response to BCR crosslinking (20). 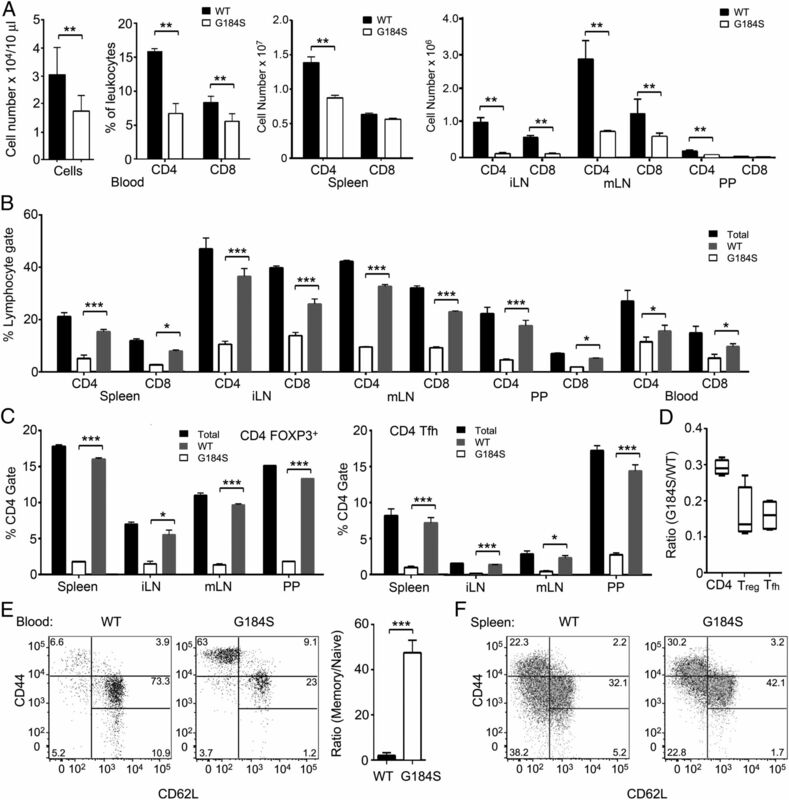 Also of note, Gnai2−/− CD4 T cells (129Sv × C57BL/6J mice) have an enhanced proliferative response following CD3 or CD3/CD28 crosslinking, which may be secondary to a reduced sensitivity of the cells to TGF-β (47, 48). How the loss of Gαi2 expression in T cells leads to a reduction in TGF-β responsiveness is not known. Thus, CD4 T cells lacking Gαi2/RGS protein interactions or simply lacking Gαi2 have a similar reduction in their migratory response to chemokines, but also an augmented response to TCR crosslinking. Whether they share a loss of TGF-β sensitivity needs further investigation. The G184S mutation often leads to enhanced signaling, as the loss of RGS protein function prolongs the duration that Gαi remains GTP bound and βγ free to signal (22). Such an explanation could account for lodging of mature thymocytes in the PVCs. However, RGS proteins also accelerate GPCR-triggered Gαi activation (8–10), and their loss may adversely affect the rapid activation of effectors following ligand exposure. This may help explain why chemokine-directed cell migration is adversely affected in these mice, and it is also the likely explanation for the poor adhesion of G184S CD4+ T cells to lymph node HEVs. Very rapid chemokine receptor–induced integrin activation is needed for rolling lymphocytes to firmly adhere prior to transmigration (49). The mean interaction time of a lymphocyte with the HEV endothelium prior to firm adhesion is only 1–3 s (50). The delayed increases in intracellular calcium and in pERK activation in the G184S T cells also support our contention that the delayed onset in chemokine receptor signaling contributed to the poor adhesion in HEVs. Further studies examining the kinetics of integrin activation in T cells and other leukocytes from the G184S mice should provide a more detailed understanding of the role of RGS/Gαi protein interactions in leukocyte adhesion. This study has identified a critical role for RGS protein/Gαi2 interactions in thymocyte reverse transmigration across the thymic blood vessel endothelium, as well as for normal thymocyte and peripheral T cell chemotaxis, lymph node entry, and lymph node egress. Previous studies in mice expressing Gαi2 proteins insensitive to RGS proteins have revealed robust phenotypes in the cardiovascular system and CNS (22). In these instances the phenotypes arose from a failure of RGS proteins to limit signaling and they behave as gain-of-function mutations. Some of the observed phenotypes are potentially beneficial, including an antidepressant-like effect and protection against cardiac reperfusion injury (51, 52). The inhibition of thymocyte reverse migration in the G184S mice may have also arisen from a failure of RGS proteins to limit Gαi2 signaling. Conversely, the poor T cell chemotaxis and the defective firm adhesion of CD4+ T cells in lymph node HEVs is best explained by a failure of chemokine receptors to quickly activate Gαi2, thereby behaving as a loss-of-function mutation. The defects in the T cell compartment in the G184S mice illustrate how RGS proteins help shape the signaling outputs downstream of ligand-activated chemoattractant receptors. We thank Dr. Anthony Fauci for continued support and Dr. Alfred Singer for helpful comments and discussions. This work was supported by the intramural program of the National Institute of Allergy and Infectious Diseases.
. 2016. T-cell selection in the thymus: a spatial and temporal perspective. Immunol. Rev. 271: 114–126.
. 2012. Sphingosine-1-phosphate and lymphocyte egress from lymphoid organs. Annu. Rev. Immunol. 30: 69–94.
. 2015. Chemokine-guided cell positioning in the lymph node orchestrates the generation of adaptive immune responses. Curr. Opin. Cell Biol. 36: 1–6.
. 2014. Chemokines and chemokine receptors: positioning cells for host defense and immunity. Annu. Rev. Immunol. 32: 659–702.
. 2015. Structural mechanism of G protein activation by G protein-coupled receptor. Eur. J. Pharmacol. 763(Pt. B): 214–222. 2016. The impact of RGS and other G-protein regulatory proteins on Gαi-mediated signaling in immunity. Biochem. Pharmacol. 114: 40–52.
. 2016. R4 regulator of G protein signaling (RGS) proteins in inflammation and immunity. AAPS J. 18: 294–304.
. 2010. Regulators of G-protein signaling accelerate GPCR signaling kinetics and govern sensitivity solely by accelerating GTPase activity. [Published erratum appears in 2012 Proc. Natl. Acad. Sci. USA 109: 2175.] Proc. Natl. Acad. Sci. USA 107: 7066–7071.
. 1997. RGS proteins reconstitute the rapid gating kinetics of gbetagamma-activated inwardly rectifying K+ channels. Proc. Natl. Acad. Sci. USA 94: 10461–10466.
. 1997. RGS8 accelerates G-protein-mediated modulation of K+ currents. Nature 390: 525–529.
. 2011. RGS10 restricts upregulation by chemokines of T cell adhesion mediated by α4β1 and αLβ2 integrins. J. Immunol. 187: 1264–1272.
. 2003. Role of regulator of G protein signaling 16 in inflammation-induced T lymphocyte migration and activation. J. Immunol. 171: 1542–1555.
. 2011. Cutting edge: regulator of G protein signaling-1 selectively regulates gut T cell trafficking and colitic potential. J. Immunol. 187: 2067–2071.
. 2013. RGS3 controls T lymphocyte migration in a model of Th2-mediated airway inflammation. Am. J. Physiol. Lung Cell. Mol. Physiol. 305: L693–L701.
. 2012. RGS16 attenuates pulmonary Th2/Th17 inflammatory responses. J. Immunol. 188: 6347–6356.
. 1998. A point mutation in Gαo and Gαi1 blocks interaction with regulator of G protein signaling proteins. J. Biol. Chem. 273: 12794–12797.
. 2004. RGS-insensitive G-protein mutations to study the role of endogenous RGS proteins. Methods Enzymol. 389: 229–243.
. 2006. Pleiotropic phenotype of a genomic knock-in of an RGS-insensitive G184S Gnai2 allele. Mol. Cell. Biol. 26: 6870–6879.
. 2012. The loss of RGS protein-Gαi2 interactions results in markedly impaired mouse neutrophil trafficking to inflammatory sites. Mol. Cell. Biol. 32: 4561–4571.
. 2015. An essential role for RGS protein/Gαi2 interactions in B lymphocyte–directed cell migration and trafficking. J. Immunol. 194: 2128–2139.
. 2010. RGS/Gi2α interactions modulate platelet accumulation and thrombus formation at sites of vascular injury. Blood 116: 6092–6100. 2015. RGS-insensitive G proteins as in vivo probes of RGS function. Prog. Mol. Biol. Transl. Sci. 133: 13–30.
. 2011. GRK2-dependent S1PR1 desensitization is required for lymphocytes to overcome their attraction to blood. Science 333: 1898–1903.
. 2013. Rgs13 constrains early B cell responses and limits germinal center sizes. PLoS One 8: e60139.
. 2009. Intravital two-photon imaging of adoptively transferred B lymphocytes in inguinal lymph nodes. Methods Mol. Biol. 571: 199–207.
. 2015. CD4+ CD44v.low cells are unique peripheral precursors that are distinct from recent thymic emigrants and stem cell-like memory cells. Cell. Immunol. 296: 106–114.
. 1999. Gαi is not required for chemotaxis mediated by Gi-coupled receptors. J. Biol. Chem. 274: 2824–2828.
. 2014. A chemical biology approach demonstrates G protein βγ subunits are sufficient to mediate directional neutrophil chemotaxis. J. Biol. Chem. 289: 17791–17801.
. 2000. Roles of PLC-β2 and -β3 and PI3Kγ in chemoattractant-mediated signal transduction. Science 287: 1046–1049.
. 2009. Chemoattract receptor signaling and its role in lymphocyte motility and trafficking. Curr. Top. Microbiol. Immunol. 334: 107–127.
. 2011. Chemokine triggered integrin activation and actin remodeling events guiding lymphocyte migration across vascular barriers. Exp. Cell Res. 317: 632–641.
. 2007. Impaired trafficking of Gnai2+/− and Gnai2−/− T lymphocytes: implications for T cell movement within lymph nodes. J. Immunol. 179: 439–448.
. 2014. Dynamin 2–dependent endocytosis is required for sustained S1PR1 signaling. J. Exp. Med. 211: 685–700.
. 2007. The perivascular space as a path of hematopoietic progenitor cells and mature T cells between the blood circulation and the thymic parenchyma. Int. Immunol. 19: 745–753.
. 2010. Neural crest–derived pericytes promote egress of mature thymocytes at the corticomedullary junction. Science 328: 1129–1135.
. 2012. The sphingosine-1-phosphate transporter Spns2 expressed on endothelial cells regulates lymphocyte trafficking in mice. J. Clin. Invest. 122: 1416–1426.
. 2007. Fibroblastic reticular cells in lymph nodes regulate the homeostasis of naive T cells. Nat. Immunol. 8: 1255–1265.
. 2001. Cutting edge: secondary lymphoid organs are essential for maintaining the CD4, but not CD8, naive T cell pool. J. Immunol. 167: 6711–6715.
. 2010. IL-7 induces rapid clathrin-mediated internalization and JAK3-dependent degradation of IL-7Rα in T cells. Blood 115: 3269–3277.
. 2012. How to find your way through the thymus: a practical guide for aspiring T cells. Cell. Mol. Life Sci. 69: 663–682.
. 2015. The kinases NDR1/2 act downstream of the Hippo homolog MST1 to mediate both egress of thymocytes from the thymus and lymphocyte motility. Sci. Signal. 8: ra100.
. 1998. Regulation of chemotactic and proadhesive responses to chemoattractant receptors by RGS (regulator of G-protein signaling) family members. J. Biol. Chem. 273: 28040–28048.
. 2007. How regulators of G protein signaling achieve selective regulation. J. Mol. Biol. 366: 349–365. 2016. Gαi2 and Gαi3 differentially regulate arrest from flow and chemotaxis in mouse neutrophils. J. Immunol. 196: 3828–3833.
. 2015. Dynamin 2-dependent endocytosis sustains T-cell receptor signaling and drives metabolic reprogramming in T lymphocytes. Proc. Natl. Acad. Sci. USA 112: 4423–4428.
. 2003. TCR-mediated hyper-responsiveness of autoimmune Gαi2−/− mice is an intrinsic naive CD4+ T cell disorder selective for the Galphai2 subunit. Int. Immunol. 15: 1359–1367.
. 2005. Impaired TGF-beta responses in peripheral T cells of Gαi2−/− mice. J. Immunol. 174: 6122–6128.
. 2005. 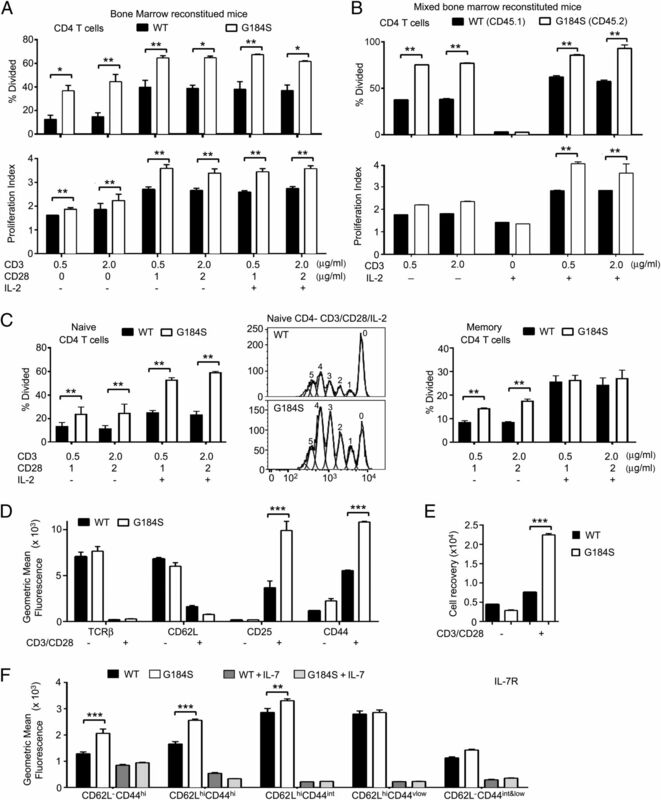 Lymphocyte arrest requires instantaneous induction of an extended LFA-1 conformation mediated by endothelium-bound chemokines. Nat. Immunol. 6: 497–506. 1993. Specificity of leukocyte-endothelial interactions and diapedesis: physiologic and therapeutic implications of an active decision process. Res. Immunol. 144: 695–698.
. 2010. RGS inhibition at Gαi2 selectively potentiates 5-HT1A-mediated antidepressant effects. Proc. Natl. Acad. Sci. USA 107: 11086–11091.
. 2011. Gαi2-mediated protection from ischaemic injury is modulated by endogenous RGS proteins in the mouse heart. Cardiovasc. Res. 91: 45–52.